In this Jan. 10, 2019, file photo, Federal Reserve Board Chair Jerome Powell pauses as he talks with Carlyle Group co-CEO David Rubenstein during an Economic Club of Washington luncheon. 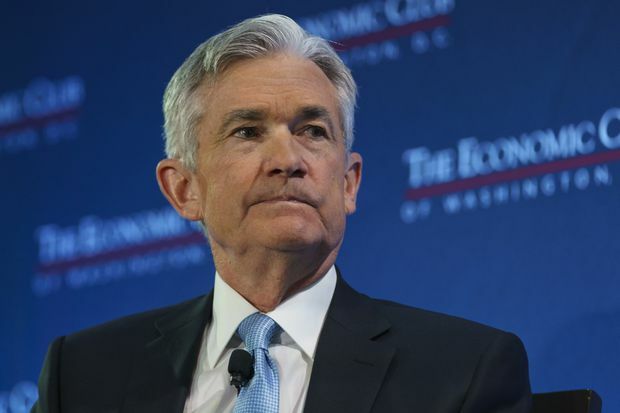 Not long ago, Powell expected to face this delicate communication test some time later in 2019, rather than at his news conference on Wednesday following the close of the Fed’s first policy meeting of the year. But three things – an unexpected scarcity of reserves deep in the plumbing of Wall Street, overt public pressure from investors and the White House, and the Fed’s own decision to rethink its interest-rate hikes – are forcing the U.S. central bank to acknowledge the real possibility of hanging on to more bonds than originally planned. “You cannot stop the rate-hiking cycle without communicating on the balance sheet as well,” said Thomas Costerg, senior U.S. economist at Pictet Wealth Management, in Geneva, Switzerland. A bigger balance sheet could result in an across-the-board easing of market borrowing costs and the foreign-exchange value of the dollar, easing strains on emerging markets. It could also affect the Fed’s appetite for bond-buying in the face of a future U.S. downturn. For more than a year, the Fed has methodically trimmed its multi-trillion-dollar balance sheet – from nearly $4.5 trillion to about $4.1 trillion and falling – without much notice. Instead, it has kept the world’s eyes trained on a series of interest-rate hikes which, according to careful messaging from policy-makers in recent weeks, may have come to an end. In December, Trump amplified that theme, tweeting that the central bank ought not to “make yet another mistake” and “stop with the 50 B’s” – a reference to the $50 billion maximum in bonds by which the Fed has been shrinking its portfolio each month, according to a plan it outlined and began in 2017. A day after the tweet, when Powell said the runoff remained on “automatic pilot,” the Standard & Poor’s 500 stock index delivered its worst 60-minute selloff in at least a year. Two weeks later, when Powell stressed that the plan was actually flexible, the index delivered its best 60 minutes in at least a year. Trump’s tweet exposed a dilemma for the Fed: though its 2017 plan divorced balance sheet policy from monetary policy, markets see a stronger connection. If the Fed is to stick to its guns on keeping the balance sheet from becoming a first-responder tool against economic ups and downs, Powell needs to keep that divorce on the books. The central bank is indeed nearing the point at which it needs to adjust its balance sheet plan, not because of the state of the domestic economy, which appears strong, but because of the plumbing of short-term markets. As the portfolio has decreased, banks have trimmed the reserves they keep at the Fed by even greater amounts, putting a strain on the Fed’s ability to control the short-term policy rate by which it steers monetary policy. Economists had already speculated last summer that to deal with mounting scarcity of reserves, and the resulting upward push on interest rates beyond a target range, the runoff would need to end two years earlier and leave the Fed with $1 trillion more than it had envisioned. For its part, the Fed aims to trim its portfolio to an unspecified level at which demand for reserves matches supply – though not to as low as the $900 billion it held before the 2007-2009 recession prompted it begin the purchases. “It’ll be substantially smaller than it is now ... but nowhere near where it was before,” Powell said on Jan. 10, framing any decision as a technical one and not a referendum on the overall policy stance. Growing questions about the balance sheet may prompt Powell to sketch out a clearer road map for the asset holdings at his 2:30 p.m. Wednesday news conference. After raising rates gradually last year, the Fed is taking a wait-and-see approach to further tightening in the face of an overseas slowdown and market volatility. But even if rates remain steady this year, the ongoing shedding of assets, including some $380 billion since October 2017, will continue to tighten financial conditions by making funding more expensive for banks. In 2017, the Fed projected it would trim the portfolio until around 2022 when it would hold $2.3 trillion to $2.9 trillion in assets. But minutes from the Fed’s December meeting showed growing internal debate with policy-makers mulling holding a larger “buffer” of securities than planned, or slowing the pace of runoff as the finish line approaches. In mid-2018, economists at Deutsch Bank Securities were among those predicting the Fed would be forced to stop the process by early 2020 with about $3.7 trillion in assets. The minutes, they wrote in a note, have “shifted the balance of risks” even more and convinced them that Powell will move to halt the portfolio runoff as early as the third quarter of 2019.